If you want to buy gold ingots, you're in the right place! At Gold Avenue, we have a selection of beautiful Lady Fortuna gold ingots available for all our customers around the world. We offer various weights in all shapes and sizes ranging from 1g up to 100g. Due to its strategic position in Switzerland and located in the heart of Geneva, Gold Avenue wants to be a leading player and new leader in the market for the purchase, sale, and storage of gold ingots and other precious metals (i.e. platinum bars). 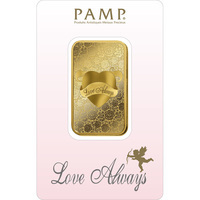 Gold is the best and most popular precious metal on the market. 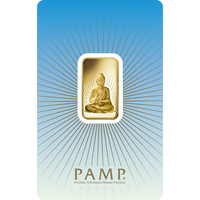 Gold Avenue offers different high quality gold ingot options. 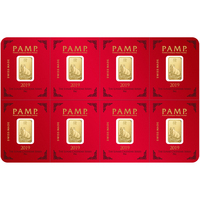 On our secure Goldavenue website, we have many gold ingots, all stamped by PAMP Suisse, one of the best and most reliable refineries in the world as well as the first brand of gold bullion in the world. 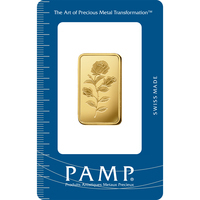 For years, it has been known to have pioneered and revolutionized the industry by launching motifs on their gold ingots to personalize them. 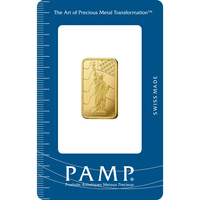 Just like gold coins, buying gold ingot is a more affordable investment option than buying gold bullion bar. You may still buy gold ingots in a multi-gram version as a gift to offer for your loved ones, whether for a particular occasion or in anticipation of an inheritance. 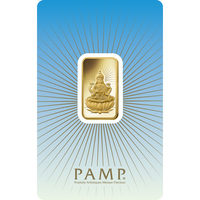 A gold ingot is considered a good and wise purchase in the precious metals market. A gold ingot is considered to have intrinsic value because there will always be a gold market, so it is a safe haven. 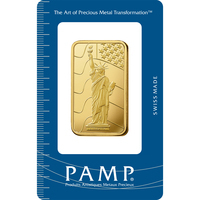 Buying bars, ingots or gold coins online is the most popular way to invest in the precious metals market. Fine gold is a timeless and elegant commodity that any investor wants in his precious metals portfolio. PAMP Suisse is the leading brand of bars and ingots in the world. They are known to have pioneered and rocked the industry by first launching an assortment of motifs to their ingots. 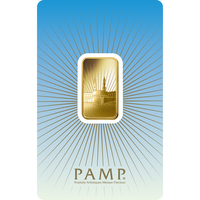 You can, therefore, find "Essayeur Fondeur" engraved by PAMP on the reverse side of the ingot along with the serial number. The first design and the most famous of all is the Lady Fortuna (Goddess Fortuna). She is a Roman goddess Fortuna, the daughter of Jupiter. She is always represented veiled, with her cornucopia, and her riches flowing on her hollow hands. 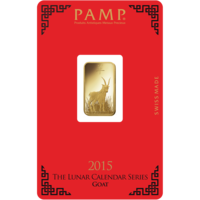 These two mythical ornaments symbolize wealth, and its powerful position to be the bearer of luck and prosperity. 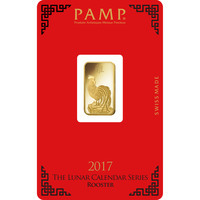 The first advantage of gold ingot lies in the fact that it is cheaper than gold bar, which makes the purchase of gold more affordable. 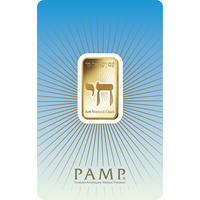 A gold ingot also offers more flexibility than a gold bar or silver bars. A gold ingot is considered a good way to diversify his precious metals portfolio investment. Gold prices fluctuate on a day to day basis as the price of gold changes separately from the stock market. Gold prices can be affected by different data and/or factors. These factors can be listed as such: the evolution of forex (particularly the US dollar) and the stock market index performance, the recession or the threat of a recession, elections, political movements, geopolitical problems, or any major current news. These are all factors to consider when entering the precious metals market. On the financial markets, the gold price is quoted in different currencies such as the Euro (EUR), the US dollar (USD), the pound sterling (GBP), the Yen, the Swiss franc (CHF) and well more besides. To be precise, an ounce of gold corresponds to a weight of 31.103g of gold. You can also follow the news and see the price of metals by day, month and year directly from our latest platform. The same goes for the silver price, platinum, and palladium. Just like buying online, the sale of your gold ingots can be done on goldavenue.com, at any time and safely on our platform. 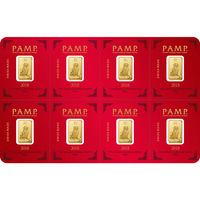 Gold Avenue buys back your bars, ingots, and other gold bullion at the SPOT price. There is no minimum or maximum amount to repossess your gold ingots or other precious metals (i.e. silver, platinum, palladium). Not having all your eggs in one basket is also wise at the time of sale. 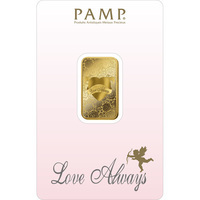 It is impossible to separate a 1 kg gold bar to divide it into small pieces, to sell it. On the other hand, one can quite sell some gold ingots while retaining some of its investment. Of course be sure to monitor the price of gold, silver, platinum or palladium when you decide to sell your gold item for example. Gold Avenue is regulated according to the rules of the Swiss financial market, namely that Gold Avenue is registered in the Geneva Commercial Register and is affiliated with ARIF, a self-regulatory organization recognized by the Swiss Financial Market Supervisory Authority FINMA. Ingots as well as coins, are particularly discrete by their size and weight and take up very little space. As such you can store your free gold bars for free at Gold Avenue up to 10 kg. All gold ingots, gold coins, and other precious metals (i.e. silver coins) are insured in our safes in Switzerland. These same safes are protected against theft, damage, and loss at all times. In the case where you opt for delivery, we advise you to use protective gloves in contact with your bars, ingots, and coins to avoid damage and scratches. Gold Avenue is a Swiss private and independent company without any governmental or banking influence. 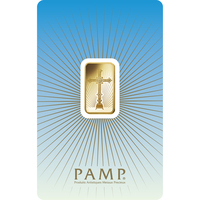 Your gold ingots and your personal information are therefore highly protected and safe.